Proving once again that Donald Trump does whatever Donald Trump wants, the GOP front-runner knowingly violated the rules at the Republican debate on Thursday night by speaking with his campaign manager during a commercial break, according to a report from CNN’s Dylan Byers. Candidates are forbidden from communicating with their campaign staff during debate breaks, but that’s apparently a rule which Trump has routinely broken at previous debates by speaking with manager Corey Lewandowski backstage. On Thursday night, however, Lewandowski actually came out onto stage to have the meeting. 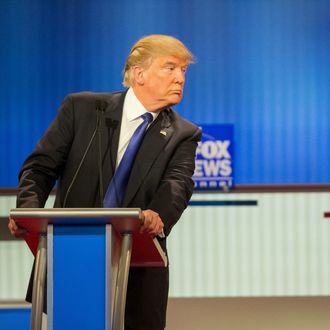 When Fox News staff were unable to convince him to leave, they then told the other campaigns that they could also have access to their candidates for the remainder of the debate, though it’s unclear what impact, if any, this may have had on the candidates’ performances.